The 2D miniLDV is essentially two independent miniLDV probes aligned perpendicularly to each other in a common housing with a common optical path for both components. The coincident measurement domains of the two components makes this a true 2D probe. The standard measurement distances available are 33, 50, 100, 150, or 240 mm*. 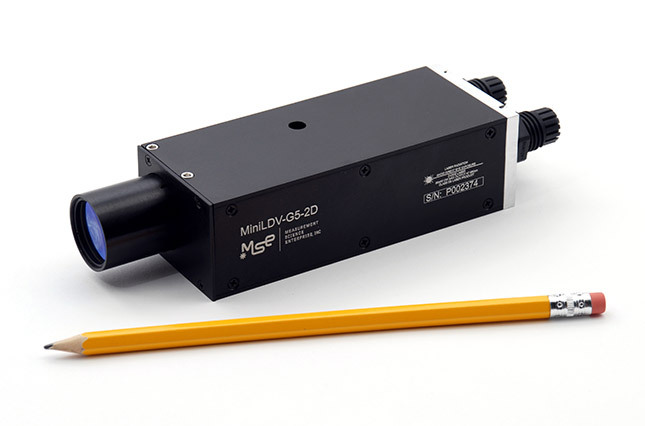 The 2D miniLDV sensor has a measurement range from 1 mm/sec to 300 m/sec with a repeatability uncertainty of 0.1% and an accuracy of 99.7%. The 2D miniLDV System consists of the 2D miniLDV probe, twin Processing Engine hardware processors with USB interface, and the 3D Burst Processor Acquisition Managersoftware. Optionally available are linear traversing systems (one or two axes) with manual or electronic drive (electronic traverses are controlled from within the software) and a computer with the software installed and verified by MSE technicians. The receiver is connected to the sensor via optical fiber, so the electronics can be safely stowed several meters from the probe. 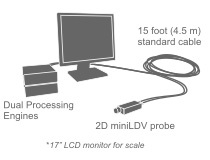 A 2D miniLDV System can also be constructed from two miniLDV probes so that they may also be used independently as single-component probes. If the standard probes do not suit your needs, feel free to contact us and inquire about our custom solutions. *These distances are measured in air. When aimed into an experimental vessel with a different fluid, the probe volume will be farther from the probe and it will be slightly larger. Please refer to the specifications at left for examples.